Mike Elliott, a former BNSF employee who sued the railroad for retaliation. Speaking up for safety, though, only made matters worse for Elliott at BNSF, where he already had clashed with managers. Within weeks the company fired Elliott from his job as a locomotive engineer – an act that a federal jury on June 30 ruled was illegal retaliation by BNSF against a whistleblower. The decision by the Tacoma jury, which awarded Elliott $1.25 million but is being appealed, spotlights the unjust punishment that critics say sometimes is meted out to railroad workers who report injuries or safety problems. These critics, including plaintiffs’ lawyers and union officials, along with others who have examined railroad practices, say the harsh treatment reflects old, hard-line management tactics that persist in corners of the industry. Likewise, safety advocates say, the ability of workers to report injuries without jeopardizing their livelihoods is crucial in a field with many hazardous jobs. Railroads have relatively high rates of on-the-job fatalities – although the toll has fallen dramatically over the last three decades. Injury totals may be substantially higher than reported. 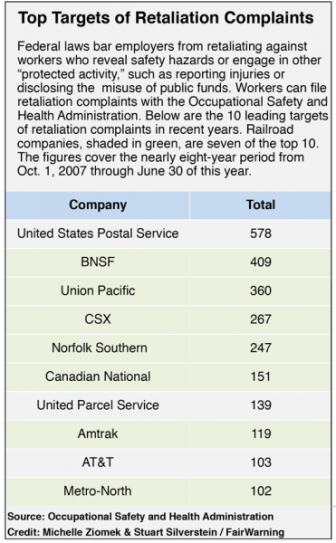 In 2012, amid widespread suspicion that railroads were undercounting injuries, in part by pressuring workers not to report them, the industry dropped its 99-year-old annual Harriman safety award, which was largely based on employee injury reports. 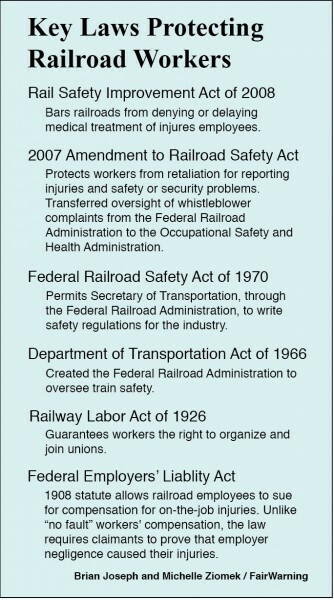 Railroad whistleblowers under federal law must first file complaints with OSHA; they can pursue their cases through to conclusion with the agency or, if their issues haven’t been resolved, after 120 days they can opt out and take their cases to court. –Steven Annucci, a coach cleaner for Metro-North Commuter Railroad, which runs in New York, New Jersey and Connecticut. Last December OSHA found that he should receive $250,000 in punitive damages, the maximum permitted in a railroad retaliation case. Annucci hurt his knee in November 2011 when he tripped on a wooden board sticking up about six inches above a paved walkway in a train yard in Stamford, Conn. General Foreman Prena Beliveau drove Annucci to the hospital. On the way there, Annucci secretly recorded their conversation. According to OSHA, Beliveau told Annucci that if you have an injury on your record at Metro-North you’re not going to move up — you’re going to be a car cleaner for the rest of your career. Beliveau also said everybody at Metro-North who gets hurt is written up for safety. –Union Pacific apprentice machinist Brian Petersen, 31, who was fired after a co-worker drove over his feet in the parking lot of a train yard in North Platte, Neb. 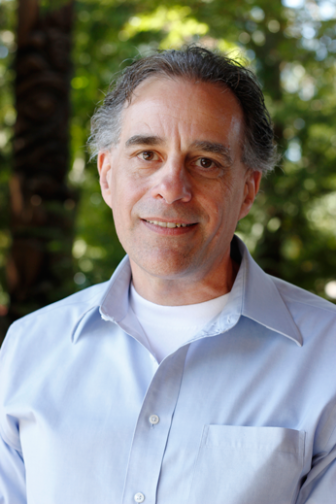 In a pair of rulings last November and February, the railroad was ordered to pay Petersen more than $400,000 in back pay, attorney fees and damages. In the spring, the two sides reached a confidential settlement. Safety has improved substantially in recent decades, Aldrich and other experts say, but the pressure on middle managers to move as quickly as possible while also holding injuries to a minimum still creates incentives to ignore or conceal mishaps. “I don’t think this is a problem that’s going to go away,” Aldrich said. But Elliott’s lawyers presented evidence that BNSF was well aware that their client was in touch with regulators in the months before his firing. For instance, the lawyers pointed to an email about train signal problems that Elliott sent to a government official, and copied to company officials, in September 2010, several months before the federal inspections.